As we drive the 395 to get to Kibbutz Tzuba the winery’s vines grace our approach – they stretch from the bottom of the hill side along the valley below and all the way to the entrance of the Kibbutz. The Kibbutz is a tech Kibbutz, building bullet-proof glass and other protective shielding, a thriving business in these trying times. As we drive up to the winery which is right on the left after you enter the Kibbutz gate – Paul Dubb is there to great us. Paul is the wine maker for the Tzuba Winery and has been growing grapes for the Castel Winery, since 1996. In 2000 Moti Zamir and Paul founded the winery and started planted vines for their label – while still tending to the vines for Castel. The 2005 vintage was the winery’s first vintage where they produced some 30,000 bottles. IN the following years they have ramped up to some 47,000 bottles. They hope to be ramping production up to 150,000 bottles in the next few years. They currently are releasing wines from the following varietal: Chardonnay, Viognier, Merlot, Cabernet Sauvignon, Cabernet Franc, Sangiovese, Shiraz, and Petit Verdot. Paul has been around grapes since a youngster – where he grew grapes with his parents and grew a love for grapes and wine. Paul’s work is evident in the Castel wines – but is also visible in his own wines. The wines are fruit forward but in a balanced manner. This he says comes from the way he tends to his vines. He makes sure that the vines have sun, while keeping them shaded, to minimize over exposure of sun, which tends to show overripe flavors and too much acid in the wine. 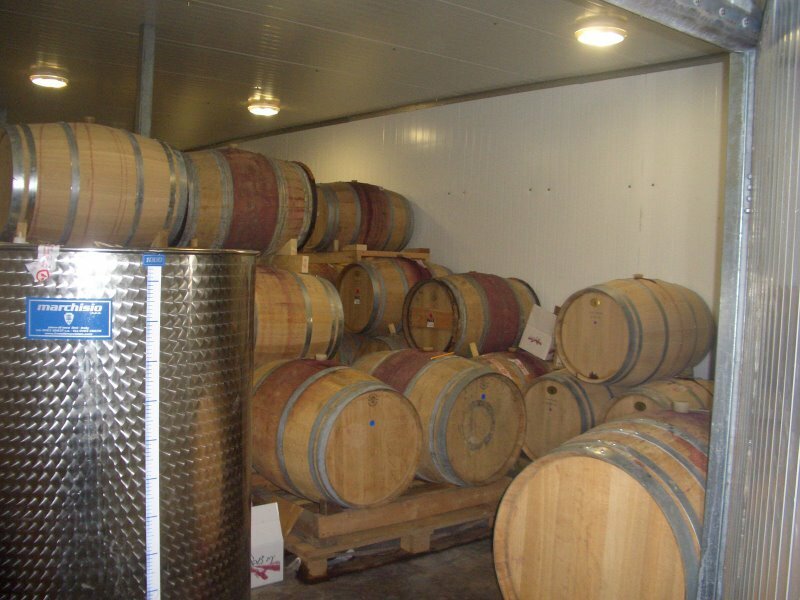 The wines are all aged in Hungarian oak and according to Paul – do not tend towards Bordeaux flavors. The winery is built to bring value wines in the Boutique winery market – something that Paul stressed is one of the selling points about Tzuba. Finally, the winery is owned in partnership with Kibbutz Tzuba – a partnership that should help the winery to compete in the ever competitive Kosher Israeli wine market. My thanks to Paul, Moti and the Tzuba Winery for hosting us and showing us around their winery. Following are the tasting notes which we sampled at the winery. Fermented at 55 degrees Fahrenheit – Sur Lie, this wine has a lovely and shimmering straw color. The nose is filled with Lychees, grass, and citrus. This medium bodied wine has a long and exciting finish and is not over oaked. The nose follows in the mouth – with Lychees and citrus flavors covering the mouth and enough acidity to balance the wine out. This ruby red wine has a nose of red fruit. The medium bodied wine has all the signature flavors of a Sangiovese – cherry, plum and added flavors of oak with soft and integrated tannins. The deep Bordeaux colored wine has a nose of red fruit and oak. The medium bodied wine is smooth with light tannins, red fruit, and a long finish that tends to linger in your mouth. This dark ruby colored wine has a nose of plum and cherry. The medium bodied wine has firm tannins, almost jammy red fruit, a balanced palate and a finish that is medium in length that is accentuated with oak flavors. This purple colored wine has a nose of fig, pepper, and earth. This medium bodied wine has jammy flavors, soft tannins, and a long finish that is supported by pepper and oak notes. This deep Bordeaux colored wine opens slowly. Over time the wine shows hints of red fruit and oak. The full bodied wine has strong tannins that show off its acidic core and cherry flavors. The finish is long and satisfying. This wine is still quite young and needs time to show its true self off. Posted on January 23, 2008, in Food and drink, Kosher Red Wine, Kosher White Wine, Wine, Winery Visit and tagged Cabernet Sauvignon, Chardonnay, Judean Hills, Merlot, Metzuda, Reserve, Sangiovese, Shiraz, Tel Tzuba, Tzuba Winery, Wine Tasting at Winery. Bookmark the permalink. 3 Comments.